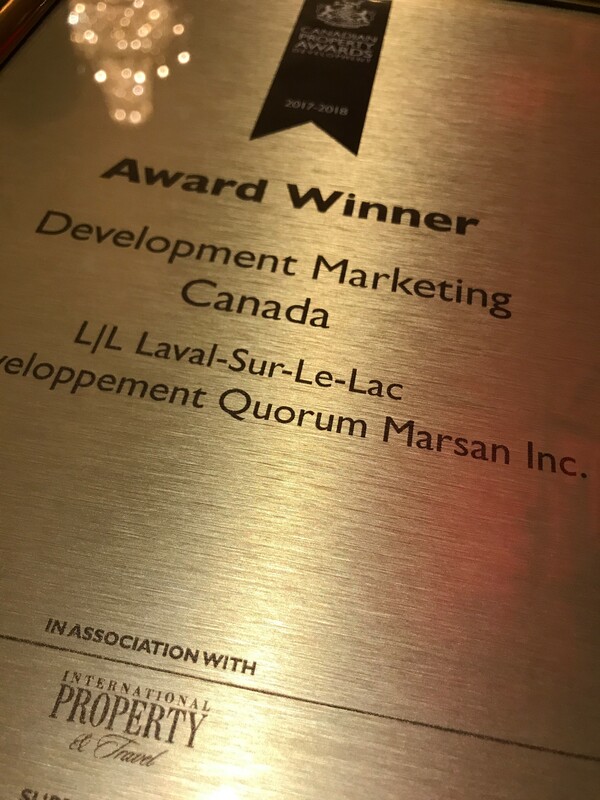 MONTRÉAL, QUÉBEC (November 24, 2017) – Groupe Quorum and Groupe Marsan are pleased to announce that the Laval-sur-le-Lac (L | L) luxury condominium project has won two Canadian Property Awards in the Development Marketing Canada and Residential Development Canada categories. The Canadian Property Awards are prizes derived from the International Property Awards. The International Property Awards crown real estate projects, architecture, design, and highlight the success of property management companies around the world. "We are extremely proud to have won these two awards, especially since it is a first for a residential project in Quebec to obtain such honors. 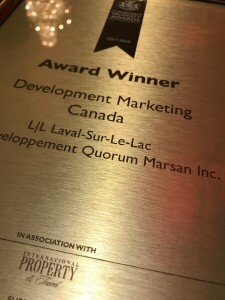 These awards are in themselves a confirmation that in Quebec, we can have projects of international scope, but also that we have the market for this type of product, as evidenced by our strong sales. We have the capacity and the knowledge to realize these big projects as much with our firm of architects Lemay + DAA, our designer Alain Desgagné than with our various professionals in development and marketing. So we can say that international luxury residential is not only successful downtown, but also in the suburbs, "said Maxime Laporte, Director of Development, Sales and Marketing for Groupe Quorum. The four-phase project is located at on the Mille Îles River where it flows into the Lac des Deux Montagnes, and adjacent to the iconic Laval-Sur-Le-Lac golf course. Each of the phases includes some 24 to 30 exclusive high-end condominium homes ranging in size from 1,500 to more than 4,000 square feet. A limited number of one and two-storey penthouses are also available. Amenities include a heated indoor infinity pool, commodious gym facilities and a private lounge space. The beautiful landscaped grounds transition impressively to the natural landscape. Parking is ample, the location is strategically located for easy highway access and security is state-of-the art. Quorum was founded by Guy Laporte and Peter Cosentini, and has been active in real estate development and construction for more than three decades. Since the company was founded, thousands of homeowners have placed their trust in Quorum to provide them with a property that meets the highest standards in the industry. The excellence of Quorum's work has earned the company the highest distinction in the residential construction industry, the Palme Diamant Maître Constructeur awarded by the APCHQ.